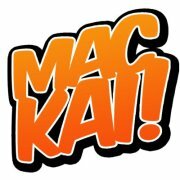 Mackai is a producer who hails from Sydney, Australia who has got me into a Genre of music called Moombahton. Moombahton is a fusion of House with Reggaeton - Reggaeton blends Jamaican musical influences of dance hall, with those of Latin America, such as salsa, Latin hip hop, and electronica. It is Electro house with the tempo of Reggaeton,around 108-112 Bpm. It was invented in 2010 by American DJ and producer Dave Nada.I have always love Reggaeton but felt it was missing something and was too vocal and not enough fat wobbling bass Moombahton is a step in the right direction. I didn't like or understand Moombahton till i heard Mackai, so far Mackai hasn't made a tune I dislike .The two tunes I listen to most are Carny and his remix of Funk D's Legendary both get me moving with their hypnotic Latin drum beats and pulsing bass. His production is clear and I'd love to hear his tunes on a big sound system. Check him out on Sound Cloud or click the image for Facebook page.